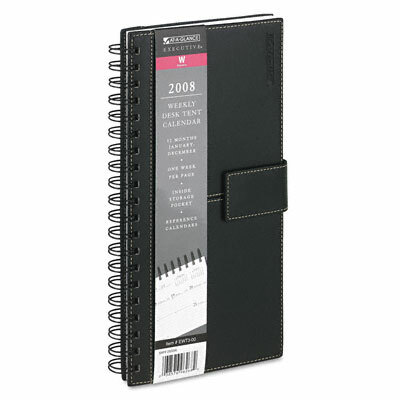 Unique snap closure allows planner to lie flat or stand easel-style on desktop. Special information section includes expense record, toll-free numbers, time zones, and area codes. Handy front storage pocket plus clear pouch for up to eight business cards. Recycled paper contains 30% post-consumer material. Unique snap closure allows planner to lie flat or stand easel-style on desktop. Special information section includes expense record, toll-free numbers, time zones, and area codes. Handy front storage pocket plus clear pouch for up to eight business cards.